For information, call Shellie Norland at 951-314-0441. Vendor spaces are currently available for 2019. Please contact us if you are interested in participating in the next event. 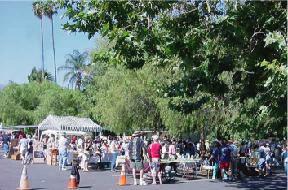 Vendor spaces are available only for antiques and collectible dealers that sell antiques and/or collectibles. This is not a garage sale, flea market or swap meet. You cannot sell food, new merchandise or craft items. If it's not old, it won't be sold. Space is limited and we sell-out fast each year. Applications are accepted on first-come, first-served basis. Please call 951-314-0441 before submitting appllication if you'd like to check if a specific space to see if it is available. Applications are not accepted without payment. Thanks! Over the last seventeen years, the annual Corona Antiques & Collectibles Faire has grown to become the park's most successful event, quickly selling out dealer spaces and packing-in the public to capacity. It has been one of the most well-received gatherings in the community. The faire inviites you to take the opportunity to attach your good name to this event through your sponsorship. We offer you noteriety through print and online advertising, as well as regular announcements in our entertainment program, in exchange for your financial support to the park. Testing the limits of capacity for possible future events held at the facility, the first annual Corona Antiques & Collectibles Faire filled the park with 30 dealers and approximately 3,000 deal-seekers. Using every available parking area, traffic and safety worked well with no imposition on the surrounding neighborhoods. Providing opportunities for culture in the community, the faire adds another aspect of exploration into art and designs of the past. More than just being able to look and learn about old stuff, you can buy it and take it home with you. 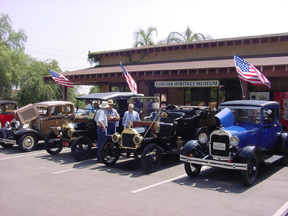 Besides the expected antique depression and carnival glass, silver, china, dolls, furniture and collectible do-dads, the Corona Historic Preservation Society had an outlet for the first time for selling architectural components and salvage. CHPS also handled the lemonade sales, which has come to be expected at any event having to do with Corona history. Other edibles began with Starbucks, who donated proceeds to the park, Krispy Kreme donuts, cookies donated by Carl�s Jr., bottled water donated by the City of Corona, and hot dogs with fried onions served by the ARC Angels. Extensive advertising for the event was done through antiques publications, newspapers, flyers, local businesses and the radio. Thanks to Steve Atkins, morning DJ of KMXN 1510 AM, for stopping and making impromptu announcements for us on the P/A. Dealers seemed pleased with their sales and buyers as happy with the variety of items. Others attending were already interested in signing up for next year�s show.